Those of you who pay attention to such things may have noticed I list my convention appearances in a widget to the right. If so, you may also have noticed a recent change there. 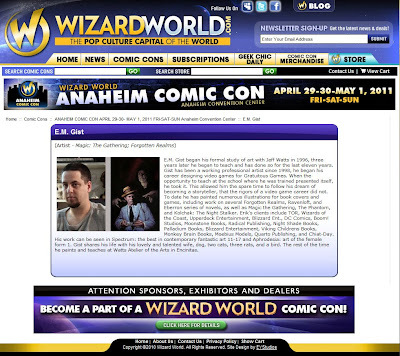 I was invited to attend Wizard World Anaheim this year, and due to time constraints I had to drop out of Horror Hound Weekend Indy. While I am sad to miss out on Horror Hound I am looking forward to Wizard World. Just prior to Wizard World I will be appearing at Monsterpalooza in Burbank, and I am happy to announce I will be once again exhibiting at IlluXCon in Altoona, PA in November. If you have the time and inclination, it would be great to meet some of you at any or all of these great gatherings.